I have never really been much of a haircut-friendly person.Infact I loathed them when I was a kid. It was always a Sunday when I was virtually dragged out of the house and placed in charge of Tultulda, an otherwise very friendly acquaintance, who used to coax and cajole me to the dreaded saloon, often with grossly unfair means such as Amul Milk Chocolates. All this, to make me sit on a queer chair with a curious looking Y shaped stick behind it which gently rested your head in its cusp while a heartless and shameless barber would meticulously gnaw away any remnants of a human look which you might have acquired since the last visit to his place. Haircuts always left me very bruised mentally and an uncanny sensation of being without clothes in the street, lingered on for at least a week after the cut. We usually had mutton as Sunday lunch which partially drowned my grief while Didi came up with sympathetic consolations of the kind that I should actually rejoice, knowing that the relatively less frontal tapering of my face clearly still distinguished me from porcupines and skunks. After all what are elder sisters for! The hair butchers charged Rs.5 for each such unwanted service then. The last hair cut I had, cost me a whopping Rs.860. No, Shilpa Shetty has not yet adopted me (inspite of me being able to pronounce her name correctly) nor was I under any vow for the past 13 years which disallowed any creature of the barber species to lay hands on my precious locks and thus my hair were not really celebrating any kind of Jata Sammelan which should have necessitated such an atrocious sum of money to have them dispersed. It just happens that I am still in the United Kingdom where the creatively deranged are usually rehabilitated by the government and made barbers, who thus naturally charge such exhorbitant rates to showcase their art on our heads. A haircutting session is usually a big occasion for us desi folks here. "Come child , if not be a son of Satan ,atleast look like one" written all over it. The barbers here are much meaner than their counterparts back in India, to the extent that they have categorised inhuman looks into simple Roman numerals. 1,2,3,4 ...You just gotta pick your number and lo behold in less than 3 minutes you can look at yourself in the mirror and guffaw away at the creature in front of you.....so agonisingly trying to look human. Human beings try to demarkate themselves from other animals in a lot of curious ways. 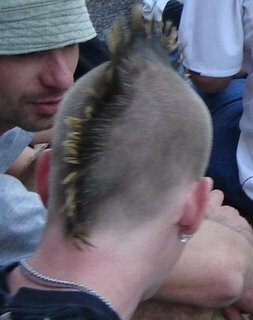 Not only are humans one of a kind in their ability to convert every season into a mating season by simple mental titillations but they are also the only in the animal kingdom with an uncanny fetish to cut their hair. For the majority of the male kind, no sooner do the poor hairlings(*) get anywhere near the soft terrain of the neck after spending months attached to that hard bony cranium shell, will a scissor appear out of nowhere and have their dreams cut short. And the curiosity does not end here.When after years of such suppression, the hair community voice their protest by suicide uprootings, men start crying foul. While some spend a fortune in having a whole new generation of hair replanted on their scalps, the less fortunate have to do with wigs which most often than not originates from hair gathered from numerous horse tails !!!! Can you beat that ? While you have your own, pay to get them cut and when all is gone, get some from a creature who used them for swatting flies and covering his excreta orifice all his life. We humans are truly unique. I so wish people spent more time,being smart than trying to look smart. The world would surely be a more beautiful place that way. great post...reminded me of my fave way of taking revenge from my brother when we were young...just remind dad that he badly needs a haircut and all his lovely locks would be chopped in a day or so...he still hates going to barber and thats the reason probably he has grown his hair quite long that its difficult to find his face hidden behing his ghastly hair. Awesome thoughts!.. sach mein!.. reality bites!.. kab tak dhoka denge hum khud ko! Ha hahaha.... this was way too good! Great writing, sire! And long long time no news of you, Amitavada! How are you and where are you? Do drop an email!